On Jan. 10, 2013, a Saturn V F-1 engine gas generator completed a 20-second hot-fire test at NASA’s Marshall Space Flight Center in Huntsville, Ala.
NASA is reigniting its mighty moon rocket engine using parts retrieved from museums and displays. Engineers working this month at the Marshall Space Flight Center in Huntsville, Ala., are completing a series of test firings using recovered components from 40-year-old F-1 engines. The 19-foot-tall (5.8 meter) by 12-foot-wide (3.8 meter) Apollo powerhouses launched the space agency's Saturn V rockets on voyages to Earth orbit and to the moon. Between 1967 and 1973, a total of 65 F-1 engines were launched, five per flight, on 13 Saturn V boosters. For these tests, which included a 20-second hot fire on Jan. 10, the team removed a gas generator from an F-1 engine that was stored at Marshall and another in almost pristine condition from the Smithsonian's National Air and Space Museum in Washington, D.C.
"Being able to hold the parts of this massive engine that once took us to the moon, restoring it, and then seeing it come back to life through hot firings and test data has been an amazing experience," Kate Estes, a NASA liquid propulsion systems engineer, said in an agency release. The team decided to take apart the gas generator, the part of the engine responsible for supplying power to drive the giant F-1's turbopump, because its component parts were small enough to be tested in Marshall's laboratories. The gas generator is often one of the first pieces designed on a new engine because it is a key part for determining the size of the final engine assembly. Once they had the artifacts-turned-test-samples in hand, Marshall's team used a novel technique called structured light 3D scanning to produce three-dimensional computer-aided design drawings of the gas generator. "This activity provided us with information for determining how some parts of the engine might be more affordably manufactured using modern techniques," Estes said. "We decided that using modern instrumentation to measure the generator's performance would provide beneficial [data] for NASA and industry." The engineers then used a digital manufacturing technique called selective laser melting to quickly produce the metal parts they needed for the test and to determine the hot gas temperature and pressure inside the test article. 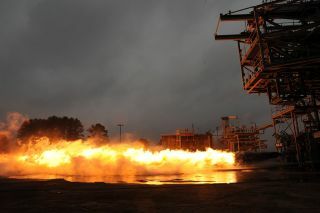 The series of hot-fire tests were conducted on Test Stand 116 in the Marshall Space Flight Center's East Test Area. "We modified the test stand to accommodate a single kerosene gas generator component," test conductor Ryan Wall said. "These tests demonstrate the stand's new capabilities, which will be beneficial for future NASA and industry propulsion activities." The most noticeable aspect of these firings is the sheer power when the gas generator ignites and creates roughly 31,000 pounds (14,000 kilograms) of force. When the original F-1 lit up, the gas generator powered the enormous turbomachinery that pumped almost three tons of propellant each second into the thrust chamber and accelerated through the nozzle, creating an incredible 1.5 million pounds (680,000 kg) of thrust. "Modern instruments, testing and analysis improvements learned over [the past] 40 years, and digital scanning and imagery techniques are allowing us to obtain baseline data on performance and combustion stability," said Nick Case, an engineer from Marshall's propulsion systems department. "We are even gathering data not collected when the engine was tested originally in the 1960s." Since NASA conducted this work in-house, the data that was collected is not proprietary. It will be shared with the agency's industry partners and academic researchers. Engineers dressed in Apollo-style white shirts and thin black ties stand by an F-1 engine at NASA’s Marshall Space Flight Center in Huntsville, Ala.
"This effort provided NASA with an affordable way to explore an engine design in the early development phase of the SLS program," said Chris Crumbly, manager of the SLS Advanced Development Office. The larger, evolved SLS vehicle will require an advanced booster with more thrust than any existing U.S. liquid- or solid-fueled booster. Last year, NASA awarded contracts aimed at improving the affordability, performance, and the reliability of the rocket's advanced booster. Dynetics Inc. of Huntsville, Ala., in collaboration with Pratt & Whitney Rocketdyne of Canoga Park, Calif. — the same company that developed the F-1 engine — will use these early tests as a springboard for more gas generator testing at Marshall. Then, they will use modern manufacturing to build a new gas generator injector that also will be hot fired in Test Stand 116 and then compared to the baseline data collected during the earlier test series. Additionally, Dynetics plans to fabricate and test several other F-1 engine parts, including turbine blades, leading to the testing of an entire F-1B powerpack including the gas generator and turbopump, the heart of engine operations. Click through to collectSPACE.com to see video of the Apollo-era Saturn V F-1 gas generator blazing back to life.